If you are like me, you are usually disappointed by technological advances. Maybe it’ s my fault. I don’t think I’m jaded, I just think that my expectations may have been too high. I can’t believe we don’t have moon bases. Why isn’t my car powered by nuclear fusion? Why doesn’t it fly?! But every now and then something comes along that just works right and let’s you do something you couldn’t do before. 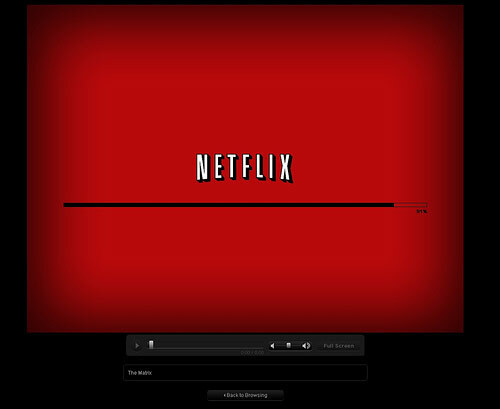 Ladies and gentlemen, I give you Netflix’s new on-demand internet video service. If you have a Netflix subscription and a machine with broadband internet access, you’re in business. All I had to do was download a small file to update my Windows Media Player (you have to use Internet Explorer 6 or higher, but that’s a minor point). Within a few minutes, I was watching “Planet Terror” in high-quality, full-screen glory. There are about 7,000 movies and TV shows currently available, so it’s not like everything is there, but the instant feature is real. It’s instant. You click on it and boom it starts downloading. You will have to wait about 30 seconds for the video to buffer, but then you are watching. If you can’t wait 30 seconds, there is something wrong with you. It takes a lot longer than that to get a DVD to start playing. You can pause it too. Lindendale thinks you all should check it out and report back.